Author Rus Bradburd loves the English language. Don’t judge this book by its cover. While the cover design won’t draw you to its contents, don’t be fooled. The story of Nolan Richardson and his struggles as an African-American college basketball player and coach is every bit as valuable to those studying the history of the Civil Rights Movement in the United States, as well as those studying the style of play Richardson created and revolutionized in the game of college basketball. Throughout his journey, the complex nature of the coach who led the University of Arkansas Razorbacks basketball program to its first and only NCAA Men’s Division I Basketball title in 1994 is on display. It was hard for Richardson to hide his feelings as a coach, husband, father, friend, and activist, and Bradburd paints the portrait of this fearless warrior on every page of this historical biography. 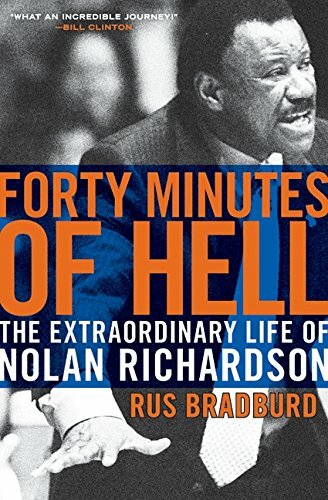 Though history may not have easily recognized Richardson’s contribution as a Civil Rights leader and college basketball coach until this book, it is an appropriate parallel Bradburd undertakes in writing Richardson’s story. By juxtaposing Richardson’s development as an outstanding athlete and coach from El Paso, Texas, with the timeline of the Civil Rights Movement in America, the story takes on a social significance beyond the “x’s and o’s” that were first introduced by the inventor of basketball, Dr. James Naismith. Bradburd’s story is more celebration than exposé of a man who worked to make a difference in America one game at a time. In the end, Richardson remains stubborn but mellowed with the hindsight of knowing that his experiences, heartaches, sorrows, pain, and joy have made a difference.